chances are, you've probably seen it too. anyway, i added to my saved links along with a bazillion other ideas that i may or may not go back to someday and went on with my day. i googled to see where one might find yarn of that size in the hopes of maybe making one for the upcoming winter months (haha, so cal "winter"), but every link led me to online shops that i'd never heard of offering skeins of the yarn for crazy money...like $50+. nope nope nope. during one of many trips to michaels for some sort of crafting supply shopping spree, i happened to walk through the yarn section - not an area i typically visit because i can't knit - and came across one sad little shelf that housed a handful of skeins of chunky jumbo yarn in just two colors - white and charcoal gray. and it was less than $15 for 54 yards of it! and since i had a couple of coupons that i could use, i picked up two in gray, took them home and buried them in a closet. there they stayed for at least a couple of months until i finally got past the holidays and all of my sewing and baking commitments. not to mention, it was something i could work on while sitting on the couch watching the season premiere of "the bachelor" with the old lady. perfect. 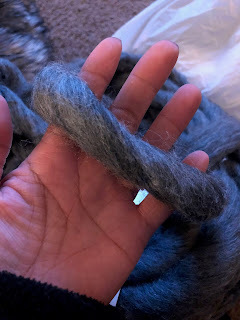 when i finally found the end of the yarn, i pulled up the video so i could follow it step-by-step. 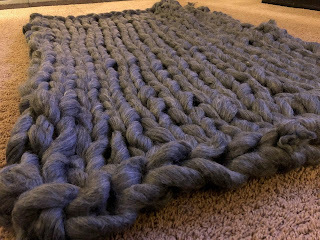 it's far from perfect, with a few skipped stitches where i missed a loop here and there. and it's pretty heavy and thick and warm, which is nice. 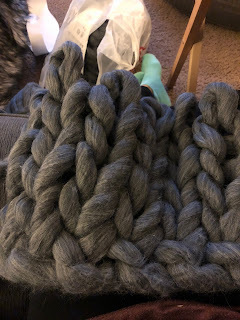 it ended up being just the right size for a lap blanket for one, and i'm already thinking about going back to michaels to see if i can find more yarn to make another one. the only thing about this yarn is that it sheds a lot, so if you're wearing black you're gonna want a lint roller if you're going anywhere after cuddling up in this thing. maybe that's why the other yarn i found online is pricier - it's probably higher quality stuff that doesn't leave you super linty. in any case, i'm pretty proud of my first successful knitting project. 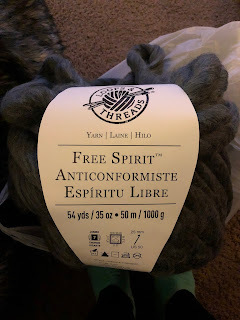 doesn't mean i'm gonna be buying needles and crap anytime soon, but at least i feel a little less like a knitting dunce. heh.